This is a failure to completely remove a lap band medical malpractice case filed in Baltimore City. This case was filed in Health Claims Arbitration on August 1, 2016. It is the 374th medical malpractice case filed in 2016 in Maryland. Plaintiff is having surgery to remove her lap-band by defendant doctor. An operative, dictated four days after the surgery, states "the band was removed in completion." Within a week after surgery, Plaintiff has multiple complaints including excruciating pain and suffering. This prompts the defendant doctor to order a CT, which shows a foreign body (part of the original lap band tubing). Plaintiff has another surgery to remove this. 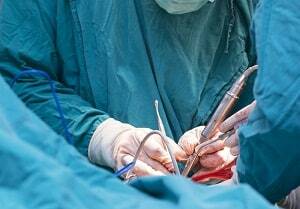 She brings a claim against the doctor, alleging that it was his duty to remove the entire lap-band during the first surgery, and that he should have examined the piece to make certain no parts were left behind in the patient after surgery. Due to the negligence of the doctor, plaintiff suffered excruciating pain and suffering and was forced to undergo a second surgery. Lawsuits alleging negligence during gastric surgeries how a low rate of success. Still, there are a lot of viable gastric bypass and related weight loss surgery claims that are very viable. There is no indication of why the lap band was removed in the first place. Was there an infection? Migration of the band? Port dislocation? We don't know. We also do not know if the original placement was flawed which caused the complication that necessitated the surgery. Sometimes the slippage of these bands into the patient's organs can cause death. We also do not know why the foreign object left behind - the remnants of the lap band - caused the complications that it did. Did it migrate to an organ? Was there an infection? Plaintiff needed a subsequent surgery, but there is no indication this is a permanent injury case. Not many lawyers are bringing non-permanent injury medical malpractice cases in Baltimore County. If you have suffered as a result of the negligence of a doctor or hospital, we can help you get the compensation and justice you deserve. Miller & Zois has a very long history of results in medical malpractice and surgical errors cases in Maryland, earning large verdicts and settlements. Get a free online case review or call us today at 800-553-8082 to speak with a caring medical malpractice attorney who can help you fight for what you deserve.